Please search these forums for issues you may have questions with before posting in the Help Forum. 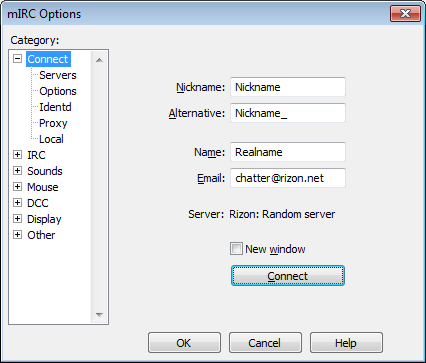 You can also ask questions in #help on Rizon itself. How to register your nick? How to register your channel? What is this "drone/flood bot pattern ban" and why does it affect me? Rizon prevents all kinds of malicious bots, drones, zombies and spambots from accessing the network to protect its users and itself. To achieve this, regular expressions are used, and even though we of course try to avoid false detections, it's possible that legit users happen to match one of those patterns. So what do I have to do now in order to be able to connect again without this happening anymore? Depending on what exactly was causing the pattern match and the resulting ban, you will most likely have to change either your nick, your username, or your realname (gecos). Below you can see mIRC's option dialog which can be accessed via Tools -> Options -> Connect. changing one of them will most likely prevent you from matching the pattern and being banned in the future. In many other cases, the ban was caused by an additional space in front of the realname as result of a mistake in the USER command sent by some clients and legit bots, if so a (closer) look at the RFC is recommended. otherwise you may have yourself unbanned using the site you were originally linked to in the ban message now. Last edited by Holz; 04-06-2019 at 01:44 AM.